You can use any part of the chicken - breast, thigh or drumstick, but I think the thighs have the best flavour. For best results, marinate overnight before cooking. 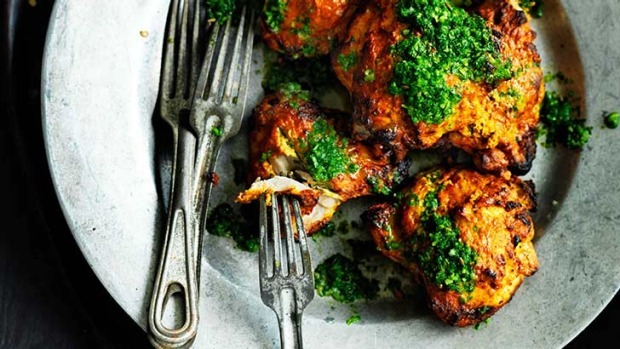 If the weather is nice enough to venture outside, the tandoori chicken is great when grilled on a super-hot barbecue. Make a few incisions in the chicken, but not too deep. This will help the marinade to get into the meat. In a large bowl, combine marinade ingredients and mix well. Add chicken, rubbing mixture in to coat well. Cover and marinate for at least 4-6 hours. Take the chicken out of the refrigerator and preheat oven to 220°C. Line a large roasting pan with foil and lay a rack on top. Place the chicken pieces on the rack so they are not touching each other. Once oven is at correct temperature, place chicken in. Turn the chicken pieces once after 20-25 minutes; they should have slightly charred edges. Roast for another 10-15 minutes, until slightly charred on the second side. Turn oven off and let the chicken rest in the oven for 20-30 minutes, propping the door open slightly with a wooden spoon. Place ingredients in a small blender and process until smooth. Slowly add water, about 1-2 tbsp, until mix reaches a saucy consistency. Check seasoning. Remove the chicken to a warm platter and serve with the relish.